"Red sangria is refreshing, but white just seems even better for those ridiculously hot Texas summer days!" Stir white wine, rum, orange juice, and sugar together in a large pitcher until the sugar is dissolved; add apple, lemon, and lime slices. 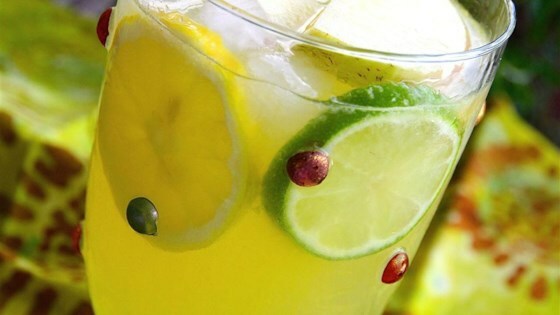 Gently stir lemon-lime soda into the wine mixture. Put frozen grapes into serving glasses and pour sangria over the grapes. See how to make this classic summer punch in three easy steps. The flavors in this will intensify if refrigerated overnight before adding the soda, but it's not necessary. Very clear sangria, not quite as "juiceful" as I'm used to, so added a little more orange juice. Otherwise it got great reviews from my guests! Served it for guests who at first said they would have a beer, then opted for the white sangria. They finished the whole pitcher! Great recipe! Only change I made was using ginger ale instead of sugar and soda. Definitely a keeper! Delicious! Added slices of orange in the mixture and also some frozen raspberries. We loved it!